At the beginning of August, Covered California announced the rate increases for 2018. 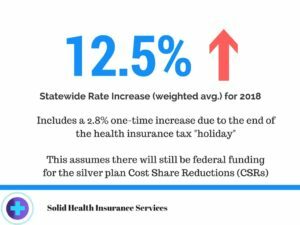 The average increase, statewide, will be 12.5 %, this includes a one-time increase of 2.8 percent tax on health insurers that resumes next year, assuming the Cost Share Reduction payment will be still funded by the federal government. Because the political debate is still ongoing, Covered California has created a workaround plan. It is not known whether the Trump administration will defund the Cost Share Reduction payments (CSR) on the Silver Level plans for low-income earners; (anyone who earns between 139 and 250 percent of the Federal poverty level, for a family of four between $ 34,200 and $ 61,500-.) The uncertainty over whether or not the federal government will continue the cost sharing payments to low-income people led Covered California to ask all insurance carriers to submit two sets of 2018 rates. While all 11 health insurance companies will return to the market in 2018, Anthem Blue Cross announced that it will only offer health plans in 3 regions in Northern California and will leave Southern California and San Francisco. This means that approximately 53,000 Anthem exchange consumers will have to look for new health plans; this number will be even higher if you count the off-exchange policyholders of Anthem individual business plans. Blue Shield will offer in all 19 regions their strong PPO health plans and in part of the regions their Trio HMO product, which they introduced in 2017. Health Net is expanding their product mix in Southern California market, with competitive HMO and PPO premiums. Oscar is also expanding to region 15, which is the Northern Los Angeles area and shows a moderate rate increase. Kaiser is shoring the most stable rate increase varying from 3-10 %, depending on the region. Molina Healthcare has some regions extreme rate increases of 20 -42%. Most consumers enrolled through Covered California will not pay the entire rate change, because the amount of financial help they receive from the federal government will also increase. Nevertheless, especially for Californians who do qualify for a tax subsidy, it is critical to shop the 2018 insurance market. Despite all this news, there is a positive side. 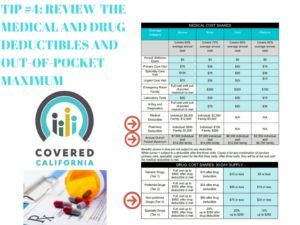 The benefit structure of the Silver plans is similar to 2017 with a slight decrease for the drug deductible. Gold and Platinum health plans have improvements, in that the Out-of-Pocket Maximum will be reduced and co payments for specialty doctor visits will be lowered. However, once again, it is necessary to shop the insurance market and be open to possibly switching providers and hospitals. Take the time to recap how many medical expenses you have had this year and try to estimate your medical need for 2018. At Solid Health Insurance Services we will keep you informed of the newest trends and keep you updated once the 2018 health insurance rates are available. Our mission is to find you affordable health insurance, which fits both your budget and your medical needs.